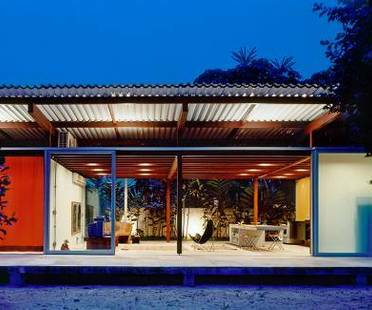 The exhibition titled “Lina Bo Bardi 100 – Brazil’s Alternative Path to Modernism” is organised by the Munich polytechnic architecture museum at the Pinakothek der Moderne. Exploring the work of Lina Bo Bardi in her centenary year. The home designed by architect Flavio Castro in São Paulo, Brazil is made up of two rectangles set at right angles, redrawing the landscape on the site. Brasiliana Library on the USP Campus. Sustainable culture. The library on the University of Sao Paolo campus, designed by Rodrigo Mindlin Loeb Arquitectura and Eduardo Almeida focuses on both culture and sustainability. A home that has to deal with difficult environmental conditions, adopting design solutions which pursue the goal of sustainability. Brazilian architectural studio Nitsche Arquitetos, São Paolo, has created a frame for admiring the rare beauty of the landscape in its plan for a home in São Francisco Xavier, Espírito Santo. 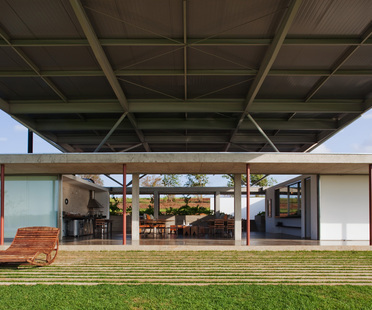 The sober concrete house designed by Andrade Morettin in Avaré, 240 km from San Paolo in Brazil, is a minimal expression of architecture in nature: the work draws a line in the landscape, along which the rooms are arranged, and another line perpendicular to it for the portico and the living room. The swimming pool nearby reminds us that we are in Brazil and this is a holiday home.